proficient with all simple weapons and repeating crossbows. They are also proficient with light armor, but not with shields. (minimum 1) to all Craft skill checks. or improve spells do not otherwise affect prototypes. items as if they were spells. of prototypes is given on Table: Machinesmith. spells or scrolls, that only machinesmiths can decipher. book may hold any number of prototype blueprints. decipher arcane writings before copying them. of times per day equal to 3 + his Intelligence modifier. Unlike mending, this ability can heal constructs. create a mobius core in order to power a greatwork. A machinesmith tinkers with their greatworks constantly. time, even the minimal down time during adventuring. process for crafting a magic item. machinesmiths take pride in producing only the best. machines to help them in their research and benefit all. skills and raw materials for their inventions. 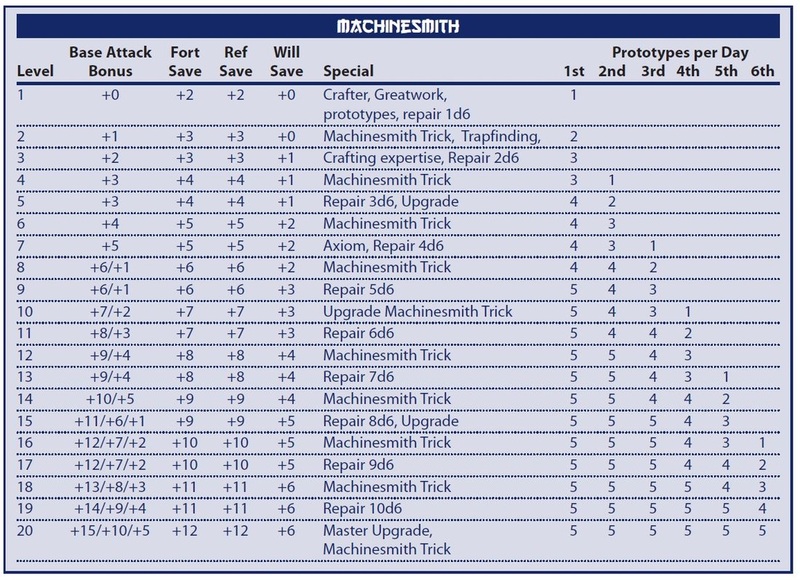 levels in machinesmith using Table: Mechanus. *A biped has arms and hands. Class Level This is the character’s machinesmith level. is applied to the mechanus’ hp. 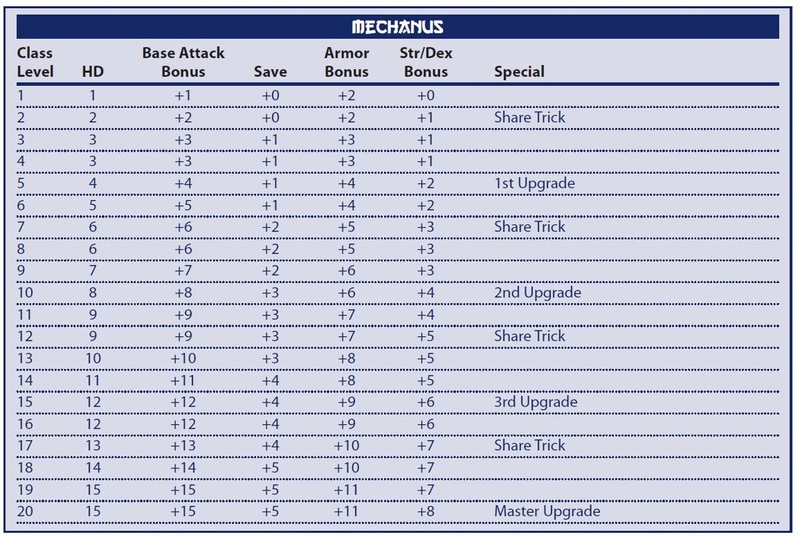 BAB This is the mechanus’ base attack bonus. construct the Mechanus has no good saves. mechanus can be enchanted again. machinesmith tricks might modify these scores. machinesmith can select an additional trick to share. of damage for every 2 HD the mechanus possesses. 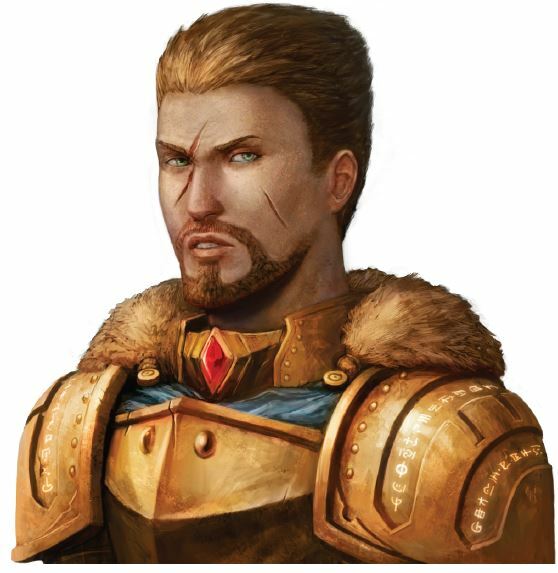 hit points based on the rules for constructs. one hour to fit the weapon with the mobius generator. upon the old weapon, or disassemble the old weapon. greatwork must be rebuilt from scratch, as normal. single feat at one time. Reload, or Weapon Specialization (mobius weapon). up to two feats to activate. weapon), or Improved Precise Shot. rolls made with his mobius weapon for one round. weapon gains hardness 10 and 15 more hit points. audio and visual information to the machinesmith. item slot for either eyes (goggles), or wrist (bracer). Intelligence modifier charges per day. darkvision up to 60 feet while wearing an analyzer. for 1 charge – deathwatch, and true strike. hours of work in order to rebuild it. require an item to be used in conjunction with them. selects this gadget trick gains a bonus combat feat. light, heavy, or repeating crossbow with an hour’s work. the hand crank as a standard action to reset the mechanisms. against the person attempting to disable it. targets as a swift action and they have 30 hit points each. Crossbow Turret trick before selecting this gadget trick. energy, choosing from acid, cold, electricity, or fire. of at least 5th level before selecting this trick. level to select this trick. level before selecting this trick. eye out for the sudden and often lethal hazards of adventuring. Reflex saves and initiative rolls. addition he gains the Gunsmithing feat as a bonus feat. least 3rd level before selecting this trick. can use this gadget only after it has been charged. normal. Using this ability is an immediate action. on strength and a +10 ft bonus to movement speed. mechanus’ hit dice. These rounds need not be consecutive. levels in place of caster level when making such items. magical item or cast by another spellcaster. develops an innate ability to ground magic with science. machinesmith level and as if his prototypes were spells. the 14th level machinesmith trick. consuming it or a wand without expending a charge. succeeds the scroll or wand is used but is not expended. skills for creative purposes or to build elaborate devices. devices capable of wreaking untold amounts of damage. determine the effects of this ability. standard action, and provokes an attack of opportunity. bombardier’s level + the bombardier’s Intelligence modifier. bomb, smoke bomb, sticky bomb and stink bomb. is ready to spring into action at a moment’s notice. initiative rolls. This replaces crafter. engineer learns how to build for durability and toughness. combat engineer’s 2nd level machinesmith trick. requires a standard action to activate as a swift action. additional group of weapons. This replaces axiom. magic and all of its practitioners. bonus prototypes for that level. items. This replaces the 10th level Upgrade ability. magic zone. This replaces the 15th level Upgrade ability. from spells, combat actions, or feats held by the caster. within range, prior to its attack, by using a move action. with all saves being equal to 2 + caster level. damage and slows the target (as the spell) for 1 round. stone to flesh can reverse the effects of calcific touch. point of fire damage per caster level (maximum +10). The fire is subject to spell resistance. Once fired, whether they hit or miss, the magic is gone. saves equal to a magic item (2 + caster level). invisibility spell at the caster’s caster level. the normal reduction in damage. anchor point, which must be within 30 ft of the target. upon a drone, the drone is destroyed. or destroyed, upon which they attack the nearest opponent. additional construct, which attacks the nearest opponent. a pile of mechanical junk. for purposes of overcoming DR.
disease, poisons, or other effects targeting you. rather than requiring an action or choice to take effect. is reduced below 1 hp or has been destroyed. piece of scroll can hold up to one minute of conversation. spell ends, the spell ends immediately. the Forgers’ Guild, forcing them to live in gilded cages. House in Aremyhk and the Imperial Palace in Awenasa. and train him for years before moving on.